Do you need reliable, effective insurance for your trucking fleet? From small businesses to large logistics companies, we provide truck insurance to a wide range of business customers both in California and throughout the United States. As one of California’s leading small insurance providers, we understand the risks you face on a regular basis as a trucking operator. Our truck insurance policies are designed to help you stay protected and run your business effectively without surprise costs or excessive fees. Trucking insurance is one of our most widely purchased insurance options. Like auto insurance, commercial auto liability insurance is mandatory in all states, making it essential that all of your business vehicles are adequately covered. Without truck insurance, you could risk fines and other penalties for your trucking fleet, limiting your ability to run your business and creating major financial risks in the event that one of your vehicles is involved in an accident. Below, you can find a complete list of our truck insurance options, information on the areas we serve and the importance of truck insurance. To request a free truck insurance quote, please contact us now on (844) 961-6161 for instant service. Do you need semi truck insurance in California? Beyond the legal importance of truck insurance, there’s the business importance of staying insured. If one of your vehicles is involved in an accident without adequate insurance, your business could face significant medical care, property damage and legal costs. We offer a wide range of truck insurance policies and options aimed at trucks of all sizes and types. Whether your business depends on small delivery trucks or large trucks designed for large scale logistics, our experienced team can help you purchase the insurance you need. We cover all types of commercial trucks. These include local, intermediate and “long haul” truckers, dump trucks, tow trucks and auto haulers, and specialized haulers designed for hazardous materials, dry freight, containers, lumber and more. Our truck insurance team has a deep understanding of industry regulations and insurance requirements, meaning we can assemble a policy that ensure you’re 100% compliant with relevant state and federal laws. The freight your trucking company transports is hugely valuable, and even a slight accident can be all it takes to cause significant losses, delays and inconveniences for your clients. Our motor truck cargo insurance protects your freight and covers your liability for lost or damaged cargo. Motor truck cargo insurance covers your liability in the event that your cargo is damaged or left on a roadway due to an accident. It also covers costs such as legal expenses that result from a client taking action and other miscellaneous cargo-related costs. As part of a physical damage truck coverage policy, you’ll be protected in the event that your commercial vehicle is damaged in a collision with another road user, a collision with another object or a non-collision accident in which the truck is damaged. From slips and falls to accidents while unloading a truck’s contents, general liability coverage is an important part of protecting your business against the cost of accidents that can occur while you run your business. For businesses that operate trucks and commercial vehicles, general liability insurance provides coverage for medical payments, property damage, bodily injury, personal injury and other highly common types of liability. Accidents, including serious accidents, can occur at any time, particularly if your business uses trucks and other commercial vehicles to transport freight, deliver items and provide service to its customers. Excess liability coverage protects your business in the event of a catastrophic accident, offering coverage for amounts beyond the typical limits of a standard truck insurance policy and helping your business move forward after a major accident and potentially costly settlement. Trucking workers compensation insurance gives your company coverage for drivers and other staff, covering your liability for medical costs and lost wages incurred by employees injured on the job. In addition to the insurance options listed above, we offer a wide range of additional insurance services for small, mid-sized and large businesses that operate trucks and other commercial vehicles. To learn more about our additional truck insurance services, or for further information on any of the insurance options listed above, please contact our team now on (844) 961-6161. With over 15 years of experience insuring individuals and businesses, we’re 100% committed to offering the highest quality truck and other insurance services at prices that allow your business to operate effectively. Thanks to our dedicated team, we offer additional value beyond your insurance policy, such as an unmatched level of customer services from our experienced staff, available 24/7 to help you answer common questions, learn more about your policy and easily make claims. At Strong Tie Insurance, we operate nine locations throughout Southern California and a single location in Miami, Florida. 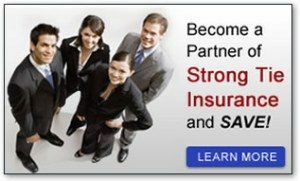 As one of the country’s leading small insurance providers, our goal is to keep your entire company safe and protected both on the road and in the workplace. In addition to truck insurance, we provide a full range of insurance services, ranging from home and condominium insurance to auto insurance, motorcycle insurance, life insurance and other services for individuals and businesses. Thanks to our excellent working relationships with industry leading contractors, auto and truck dealers, body shops, technicians and other service providers, we can provide fast and highly effective service the moment you need it. As an insurance provider, we use modern computer systems to allow you to review your records and manage your account online. From making payments to requesting changes, staying on top of your account and insurance policy is a quick and easy process. Would you like to learn more about our truck insurance services? To learn more about our wide range of insurance options or to request a free quote for your requirements, please contact us now on (844) 961-6161. Because we’re a small insurance company, we’re committed to providing unbeatable service to our customers. Our experienced team is available by phone 24/7 to answer your questions and respond to your needs without delay. Whether you use trucks for local deliveries or regional logistics, it’s essential that your trucking fleet is properly insured. Truck insurance covers you for everything from physical damage from collisions and accidents to cargo damage, personal injuries and more. With over 15 years of experience, our expert team has assisted tens of thousands of California businesses that require truck insurance coverage, helping both small and large businesses find and purchase policies that meet their needs. Thanks to our dedicated team, we can work from your requirements and ensure you receive a fair, effective insurance policy that reduces liabilities and allows you to effective manage risks. To get started, call our team now on (844) 961-6161 to request a free quote for your trucking insurance policy and learn more about the options available to you.